White Wolf : 25 Wolves Chase Down Bison: One Of The Largest Wolf Packs Ever Filmed. 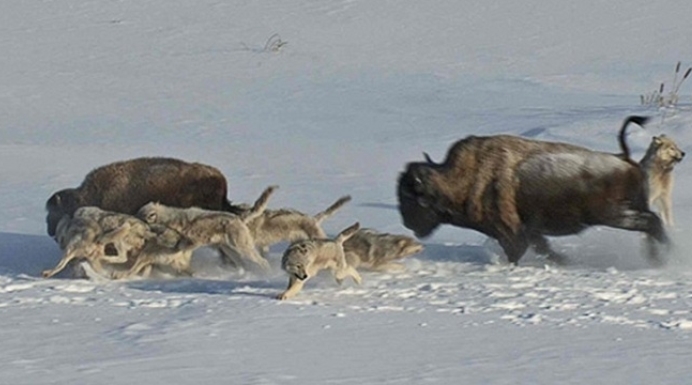 25 Wolves Chase Down Bison: One Of The Largest Wolf Packs Ever Filmed. This video is the first of its kind. A pack of northern gray wolves — at 25 members strong, one of the largest wolf packs ever filmed — chases down a herd of wood bison, the largest land animals in North America. This scene from the upcoming Frozen Planet series was filmed in Wood Buffalo National Park in Canada’s Northwest Territories at the height of the Arctic winter. At -40°F, this was the coldest shoot of the entire series. The filmmakers used an aerial camera, mounted to the side of a helicopter, that was controlled from inside via a computer and joystick. Forgoing warmth in favor of dexterity, aerial cameraman Michael Calin — a native of southern sunny California, who had never experienced temperatures like these before — made the tough decision to remove his heavy gloves in order to keep up with the action. The camera itself was wrapped in insulation; at -40°F, electrical cables can easily short-circuit. Calin and Director Chadden Hunter flew for hundreds of miles before spotting the wolf pack, which was already on the hunt. From the helicopter, they could shadow the wolves without influencing their natural behavior. Responses to "25 Wolves Chase Down Bison: One Of The Largest Wolf Packs Ever Filmed." Bison and people are a lot alike when in panic. You push others aside to get away. Lol. Nature at it's finest. It's how things should be done, naturally. I love how it appears some members of the wolf pack actually drove that larger bison into the one they targeted. If you watch the video, you can see some of the wolves following after it. It's a great strategy. Like all majestic creatures they will sacrifice one of its own to preserve the rest of the pack. The few buffalo that straggled behind was part of survival. Not that any kind of expert. I have watch a coule of things like this before. Awesome. And sad, but Nature know the ecosystem much better then us. To bad the wolf haters of the world can't figure this out. It's nature. And for our own good. We will pay one day for mans interference!!!! My impression: the bison that bowled over the harried bison sacrificed him for the sake of the herd. The targeted bison also looked older, weaker and slower than the rest. Simply Amazing! The ebb and flow of nature and life in full play and captued for all time! Amazing footage. I have never seen a wolf pack this size. Incredible!! While it may look cruel to some, this is how nature intended it to be. It isn't like wildlife can saunter in to a grocery store and buy their food. They have to eat. Wolves are great strategists. They are so in sync with each other, they all know their place and what is needed to get the job done. I agree about the other Bison mowing down the one being brought down. It all came down to survival.